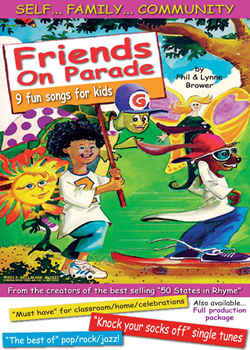 "Friends on Parade" is a fun collection of inter-disciplinary songs which can be used individually in the classroom and/or as an entire musical. Puzzles, think sheets, and other activities which relate to the music are also available with the complete package. "March of Friends on Parade"
"I'm My Own Best Friend"
"Give a Cheer for the Dear Family"
"The Earth is My Friend"
"Sing a Song for the People of the World"